The perfect program to help 11th graders prepare for college applications. Junior year is an important time for college applications, as it's the last year to make big changes that can impact your admissions profile. If you're aiming for selective schools, focusing on optimizing your profile Junior and Senior year can significantly change the trajectory of your applications. Strengthening their extracurricular profile for college applications. Creating a school list early enough to make last minute, school-specific tweaks to their profile. Securing recommendation letters that positively impact college applications. Making the most of their final summers, which is one of the most important aspects of their extracurricular profile. Completing their standardized testing profile. During Spring Term and through the summer, Juniors are referred to as "Rising Seniors." Our College Strategy Program was built with Rising Seniors in mind, in order to help them prepare for Senior year, optimize their profiles, create an application plan, and put together a realistic school list. Take advantage of this critical time that can make a huge impact on your college admissions outcomes! We are experienced in getting applicants accepted to the best schools in the nation. We increase our student's chances of getting into the most competitive schools by about 4x. Our students are accepted by the toughest admissions committees in the world. As A Junior, What Should I Be Focusing On Now For College Applications? We'll assess the strengths and weaknesses of your academics, extracurriculars, test scores, and more, and work with you to develop a set of strategies for your Junior year and over the summer to get your profile admissions-ready. Our system of over 100,000 data points creates a list of reach, target, and safety schools that meet your needs. Our Chancing Engine uses years of admissions data and your profile information to assess your admissions chances for each school. There are a lot of things students can be doing during this time, but not everything will make a difference. Create a plan to ensure that your work now will lead to great admissions outcomes when you apply to college. How Do We Help Juniors Prepare For Applications? Junior year is the time when many students’ extracurricular profiles really come together and have the biggest impact on college applications. We’ll help you optimize yours at this critical time. Our Chancing Engine is like no other. We use over 100,000 data points to give you realistic chances to schools on your list. This information is invaluable when it comes to making tough choices. Applications cost time and money, and it doesn’t make sense to be aiming in the dark. 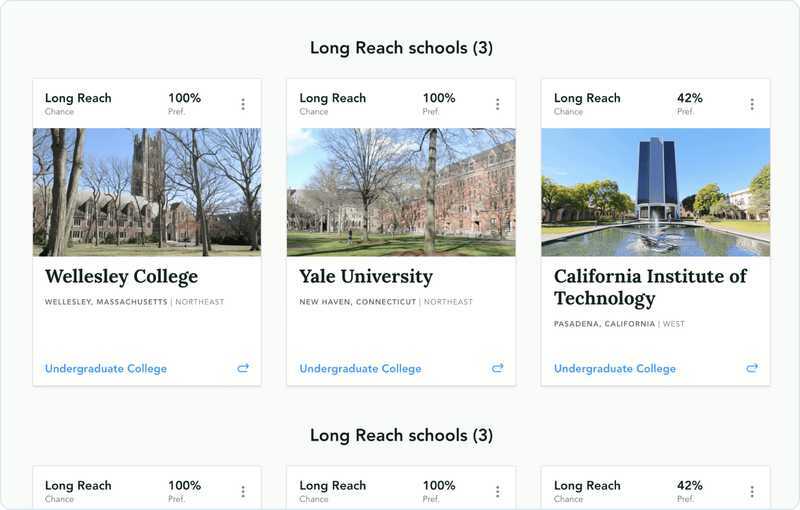 Using data from our Chancing Engine, we’ll help you build a school list that is perfectly balanced, allowing you the ability to focus on the applications that matter. Admissions Officers take a close look at the summer before your Senior year. It’s your last chance to really beef up your extracurriculars and define experiences that can help bolster your college application. The courses you take Senior Year do matter on the transcript you submit to colleges. They show admissions committees your commitment to excellence and your trajectory. We'll help you choose the right ones. Not sure if your scores stack up or if you should take the SAT again? Wondering which tests to take? No sweat! We’ll advise you on the best course of action to take as you go into Senior year so that you can meet your admissions goals. Recommendation letters may seem like a simple check-in-the-box — but who you ask for rec letters and how you ask can make all the difference for your application. Yes, admissions committees do read the letters, and they can sway decisions. We’ve helped over 6,000 students successfully apply to college with great results. We’re constantly churning data and staying up-to-date on current trends to bring you the best and most accurate admissions information available, so you can see your profile the way an admissions officer will. The admissions process gets stressful and you'll have many questions. Our mentors will be there to answer them all! You'll build a relationship with your near-peer mentor who was in your shoes not too long ago. They'll be there to walk you through every step. All of our Admissions Consultants are from the top schools in the country. We rigorously train each consultant in our data-driven curriculum that has successfully helped over 6,000 students apply to college. We know that everyone's situation is different and that the admissions process can be stressful. That's why all of our sessions are 1 on 1, allowing for each session to meet your specific needs. Our sessions are all conducted virtually, allowing you to work with talented individuals all over the nation and at schools you're interested in attending. Feel comfortable working on your application strategy from anywhere! Extracurricular Profile Strategy: We will score your extracurricular commitments in order to assess their strengths and weaknesses on your application. We will then recommend next steps to develop your extracurricular accomplishments. Senior Year Academic Advising: Based on your high school transcript and goals for the admissions process, we will recommend courses to take in Senior year that maximize your chances of admissions success. Our Chancing Engine uses over 100,000 data points to create a list of reach, target, and safety schools that match your preferences. Using years of admissions data and your personalized profile information, we are able to give you an idea of your realistic admissions chances for schools you’re interested in. Your Admissions Consultant will match your profile and preferences with our database of universities to develop a list of schools that you can apply to in the fall. Your School List will be broken into Safety, Target, and Reach categories and will include information about each school’s characteristics and admissions milestones to help you with your applications. Knowledge is power in the admissions process! We'll walk you through all the steps of the process through the eyes of a successful applicant. You’ll receive strategic guidance to make your college admissions journey as stress-free and successful as possible. Is your SAT score high enough to get you into your dream school? Should you take it again? We'll analyze your scores and make a plan for maximizing the test results for your college applications. Many students wait too long to obtain their recommendation letters. We'll help you with all aspects, including selecting the teachers to ask and crafting the briefing materials that you should give them to maximize the impact of their letters. I'm not a junior yet... can I sign up? Do juniors really need to be thinking about college applications? What can I expect when I fill out the form below? How does this program differ from your College Applications Program? What if I want help completing my applications and writing my essays?